Disparaging, empty, hopeless: the world according to Stephen King. Made popular by the 1976 film adaptation of King’s book, Carrie has been a longstanding icon of horror, but not for the reasons one might suspect. Forget jump scenes and zombies, the horror of this small town tragedy holds large-scale relevance, shedding interrogative light on the terrifying truths of inevitable defects in human nature. Every school in every city in every country holds the same basic hierarchical structure within the student body. There are popular people who write the rules, and there are unpopular people who subscribe to said rules blindly. And then there are the Carrie Whites. I know off the top of my head who my Carrie White was in high school, and that’s what makes this story effective. It hits so incredibly close to home, which is important, because when things go a little supernatural later, nobody remembers that they think telekinesis is impossible. Telekinesis is Carrie’s leverage when crawling out of the pit of sin her zealot mother dug for her. The power to move things and break things with raw emotion and sheer will is enough to scare her mother submissive, if only until the clock strikes midnight in this perverse Cinderella distortion. Centered around the uncertainty and discomfort of puberty experienced universally, Carrie amplifies this familiar anxiety, and takes it to a darker place where everyone is lost and there doesn’t seem to be a way out. 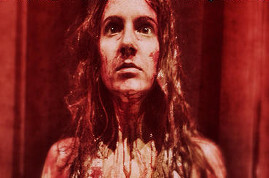 Carrie: The Musical at Milburn Stone Theatre was pervasive, and that is a sincere compliment. From the moment I walked in the theatre, I felt trapped. Before the show even began, there were video images of blood dripping into water that were projected on the white silk scrim curtain, and Gregorian chants were echoing through the house. Director Lee Lewis mastered a tricky balance between claustrophobia and utter isolation. The set design, for which Bob Denton is responsible, reflected the distance between Carrie and her classmates and the smothering nature (lack of distance) between Carrie and her mother, Margaret White. The kitchen table where the Whites ate was set so far upstage that I felt like I was looking through their window from a tree branch across the street; an odd feeling for an audience member to still seem intrusive from so far away. It’s the little juxtapositions like this that made this stage production of something we’ve all seen before on screen a unique work of art. Creating an atmosphere is an abstraction that is hard to obtain, and the creative team at MST did. The cast was dynamic. I pitied the characters, I abhorred the characters, I mourned the characters. Megan Valle, our Carrie White, showed a lot of dominance actually, in her innocence, which is something that I think a surface-level reader might have missed. She was naïve, and she was totally alien to the social cues of public high school, but she stood firm to authority figures and defended herself. The best moment in the show came at the close of the first act when Carrie uses her telekinetic powers in front of her mom for the first time and then calmly explains that she is no longer under her mother’s possessive sordid control. Then she just sits down and eats pie quietly under a spotlight while her mother cowers on the steps — half ready to burn Carrie at the stake for witchcraft. The subtlety of the scene and the anticlimax before the curtain fell was brilliant. Valle also had a very believable interaction with Tommy Ross, played by AJ Melendez. Melendez was incredible. He rocked the good boy stuck in a bad boy persona quite well, and his voice was simply beautiful. He didn’t sing until well into the first act, so I honestly gasped when he started singing because I wasn’t expecting it. Chris Hargensen, the evil instigator, played by Jackie Kappus, was a well-rounded bully. I saw weakness in her despite her cockiness. You could have heard a pin drop when Sue Snell, played by Christy Wyatt, yelled at Chris giving her a taste of the humiliation she had been administering liberally to everyone else. Wyatt did a great job of showing the transformation in her character from just being one of the many voices chiming into the hatred to being the one voice willing to speak out in kindness. I believed Wyatt. Her relationship with Tommy Ross though seemed a little forced. Miss Gardner, played by Lauren Spencer-Harris, was a critical role for Carrie to see the positive influence a woman could have on another woman, plus Miss Gardner was the only one who could crack Chris’ self-entitlement. Spencer-Harris also had a beautiful singing voice that blended well with Valle’s. Margaret White played by Kirsten Kunkle, was a foil to Carrie, but she could have brought more to the character I think in terms of self-loathing. I wanted to know more about why she thought the things that she thought. Her monologue/solo about “the sacrifice” didn’t quite lead to the ultimate buildup of her stabbing her daughter. There was just some sort of intensity missing. I consider a great accomplishment of the production to be the believability of the high school setting. So often, in movies especially, high school parties are depicted as grandiose exaggerations of what a 17-year-old could ever get away with in their parents’ house. This was a modern look into the average high school, where kids take selfies during class with their cell phones, and make fun of each other with smiles plastered on their faces, and play the drinking game ‘Kings’ on a folding table in someone’s basement. Chris was believable because Kappus avoided turning her into a caricature. Norma, played by Colleen Scott, was a sassy accomplice who really stood out. Billy, played by Matt Peterson, fell a little too far into stereotype, but so did John Travolta in the original film adaptation. I’m not sure if Billy is even supposed to be a person or just a representation of Chris’ power over people. I loved the decision to leave the crumpled paper from the first company number all over the stage to signify dilapidation and the unwillingness for the characters to clean up their messes. The special effects were frankly underwhelming, with the exception of Carrie’s revenge after the blood spills on her. When she closed the windows in her house, and when she moved the chair in the library, the general audience reaction was kind of muddled. It was apparent that people were concerned that they had missed something — when in actuality the effect was just a little too small to warrant the loud music and thunder crashes. The cast worked well together, the realness was definitely there, and I cared about what was happening on stage. Those aspects are more important, ultimately, than whether or not the bells and whistles impressed me. Acting is about recreating the elusive quality of human interaction. It all boils down to a study on how people choose to share the world with each other. I forgot that I was sitting in a seat in a theatre in Northeast, Maryland. The emotional story drew me in, and I cried. That is one of the best gauges of success in my opinion. This article can be linked to as: http://showbizradio.com/go/9773.